Butia species: a complete overview! The Butia genus is one that makes many hearts beat faster. 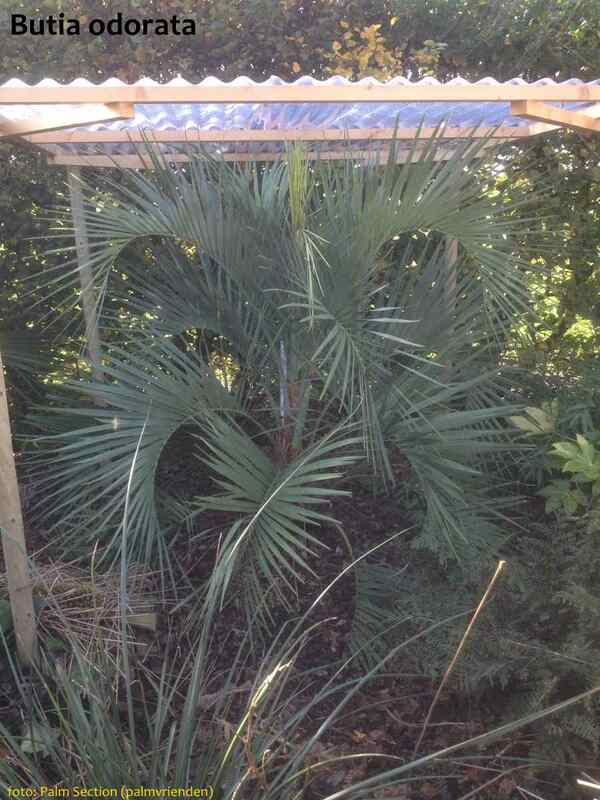 With the beautifully bowed leaves, this palm has a beautiful appearance. 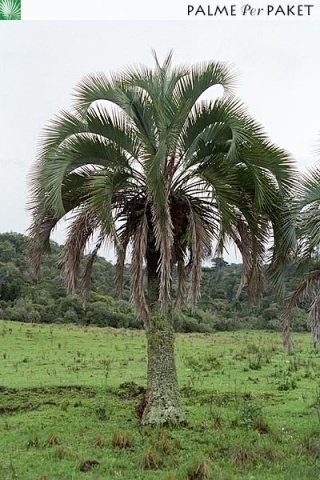 The Butia originates from the south of Brazil and surroundings and forms a bit of the bottom for what is still feasible for a north European climate. 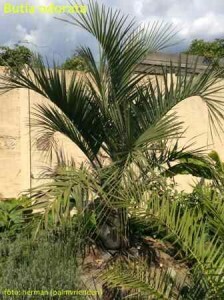 There is a lot of confusion in the naming of the Butia genus. The old names suddenly did seemed appropriate a few years ago and some species even exchanged their names to complete the confusion. As a result, it is always important to pay attention to what species your dialing with exactly. Often the old name is still used. Also by specialists. extreme small species (40 cm – 1 ft 4 in.) with underground stems. Lacks spines on its petioles. The real one! Endagered species, very rare in Europe. (old name: Butia odorata). Butia bonnetii is also just als synonym. Small species (stem to 2m (6 ft 6 in) height and crown to 2m wide) well suited for smaller gardens. Endangered species due to overgrazing, but often sold in Europe. Grows on 1200m (3937 ft) altitude. Thick stem and often greener foliage than the odorata even if there are some variations within the species. (Old name: Butia paraguayensis) Local name Butia-zinho. Small species with small stems on the base. Butia sp. 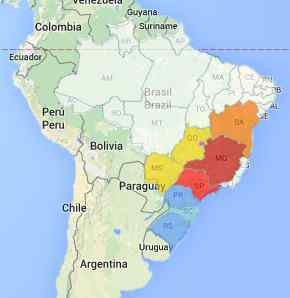 ‘Rio Grande do Sul’ is a synonym. Without or only with a little stem. Only recently discovered (2009). Very endangered species, without stem. Native to north-east Paraguay. Little known about this species. Only recently discovered (2008), named after its habitat. Endagered species. Very small, almost grass like up to 60cm (1 ft 11 in) height. Accepted name (2011) but also still called as a synonym for the Butia yatay. (Old name: Butia capitata and still often sold under that name!!). 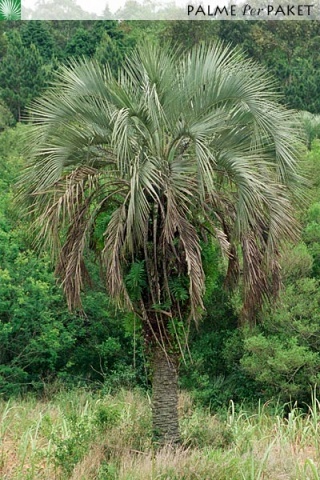 Synonym: Butia capitata var. odorata. Even on PACSOA it is still to be found under its old name. Leaves varies from green to grayish-green. One of the most hardy Butia’s. Slow growth rate. Small species with underground stems. The big leaves often bend over to the ground. Stemless species, recently discovered (2008). Bigger and thinner stem than the Butia odorata. Leaves bend over more and are more grayish. 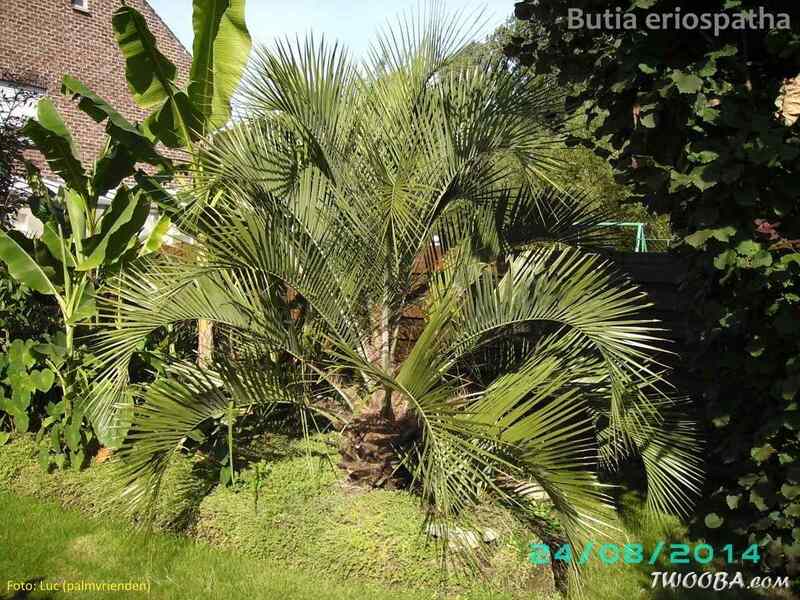 This is the biggest Butia with 8-12 meters (26-39 ft) height. 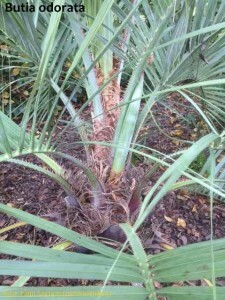 Butia capitata var. liliaceifolia (Chabaud) Becc. Butia nehrlingiana (Abbott ex Nehrl.) Abbott ex Nehrl. 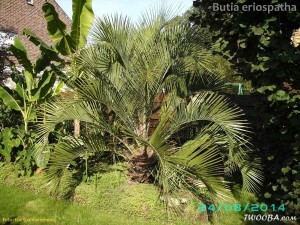 Butia yatay var. 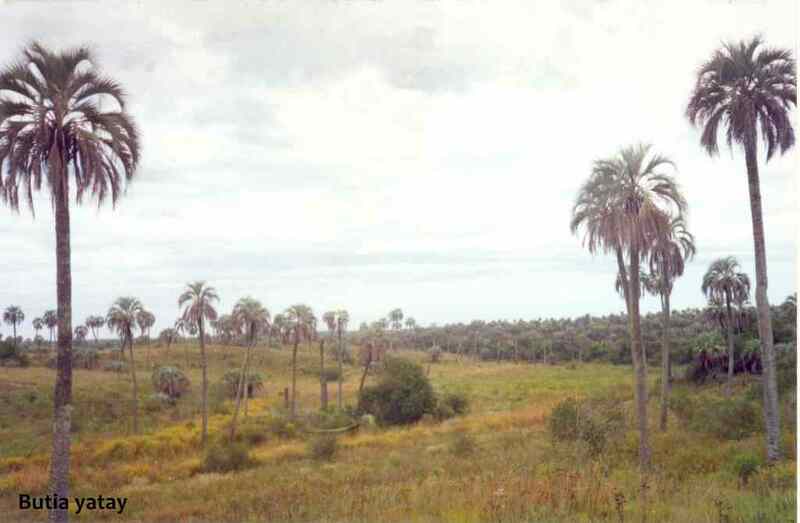 paraguayensis (Barb.Rodr.) Becc. Within every Butia species there can be a lot of variation which can make determination very difficult. 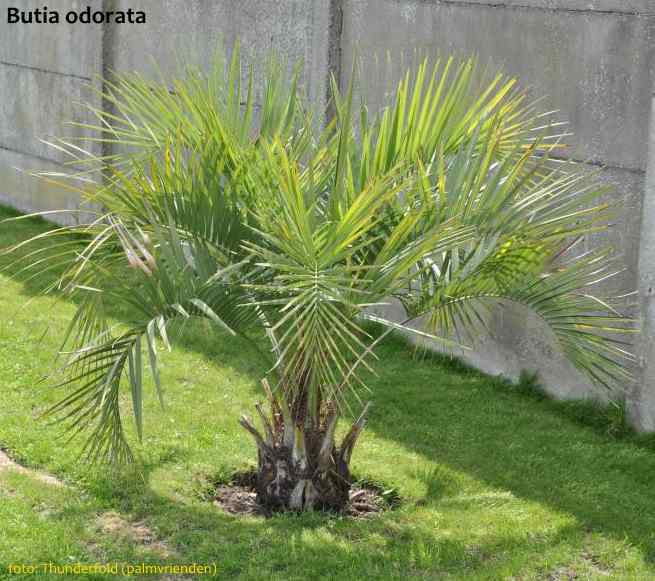 The three most used species in Europe are the Butia odorata, Butia eriospatha and Butia yatay. 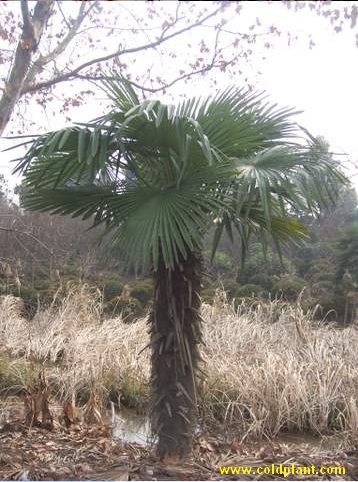 The yatay is easily recognized by its grayish foliage. When having access to the seeds it becomes a children’s play . . its seeds are oblong. Those of the odorata are round. To separate the odorata from a eriospatha you should look at the leaf bases. The leaf bases of the odorata has a purple-brown coloring where those of the eriospatha are much greener just as the rest of the foliage of this species. The tomentum, the fine hairs on the petioles, are also colored slightly different. The foliage color on its own isn’t really reliable for determination as the exposure can have some influence to the color. The more it will be exposed to full sun, the whiter the leaves will be. Butia’s are fairly slow growers. Especially in the early years. If you have the opportunity, it is would be more interesting to start of directly with a slightly larger subject. They need quite some heat to grow and therefor only grow later in the season. This is why the should be planted on the most sunniest place in your garden. For a spot in the garden, only the Butia odorata, Butia eriospatha and Butia catarinensis seem the be appropriate if protected! Some expercience with winter protection is therefore required to be successful. It is hardy to about -10/-12°C (14/10°F) but also needs a dry place well ventilated. A temporary roof above the palm is a must. Our preference for a spot in the garden goes to the Butia odorata. This species seems to have just a little more resilience than the other species. The other species are especially suitable for holding in a container. The summer months are not a problem. 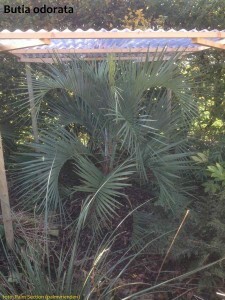 In the winter months it is important that the palm is kept in a sufficiently ventilated place. All together, the Butia is a great genus but definitely not recommended for beginners.